"Bite-sized morsels perfect for kid's parties are made of creamed corn, flour, and cheese. And no, they don't taste like chicken." Mix together the Cheddar cheese, corn, olive oil, and self-rising flour to make a firm dough. Roll the dough out into a log shape, and cut into 16 equal pieces. Roll each piece into a ball. Cut the cocktail wieners into 6 slices each (there will be 2 extra slices). Pick out 8 almond slivers. 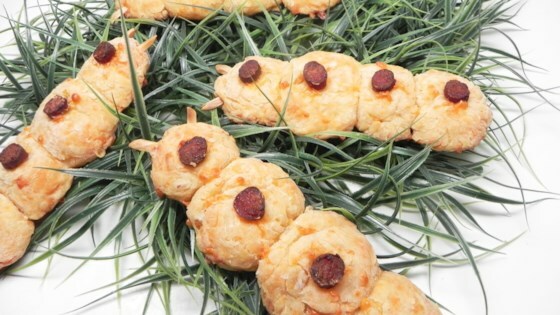 To make the grubs, place 4 dough balls onto the baking sheet, and press them tightly together so they make a lumpy grub with 4 segments. Place a slice of cocktail wiener on top of each segment for markings. Stick 2 little almond slivers into an end ball to make eyes. Repeat for the other grubs. Bake in the preheated oven until the grubs are golden brown, about 15 minutes. Fun! Thanks for sharing! I thought the dough could use some herbs. Regardless this was fun and one I would make again.